FLORHAM PARK, N.J. — Jets safety Jim Leonhard has a bright pink shiner under his left eye to match the bright pink smudge on the right thumb that he broke earlier this season. He also got kicked in the back of the head last Sunday when his helmet popped off as he pounced on a loose ball. Leonhard said Wednesday that he did not know who hit him in the face. 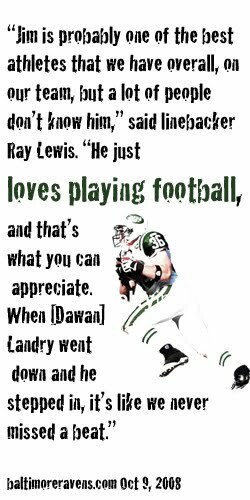 He does know from watching film that linebacker Bart Scott, his longtime teammate, kicked him in the back of the head. “Friendly fire,” Leonhard, smiling, said of the kick. “The good part about that was that he made it out alive,” cornerback Lito Shepherd said. Leonhard also lost his helmet after he made a tide-turning interception that led to the go-ahead touchdown in the 17-14 upset of the San Diego Chargers. He publicly promised his wife, Katie, that his helmet will be tighter for the American Football Conference championship game against the Indianapolis Colts on Sunday. But he is not promising he will back off from playing hard. This may be the Jets’ first A.F.C. title game since the 1998 season, but it is the second in a row for Leonhard, Scott and Coach Rex Ryan, who were with the Ravens when they lost to the Pittsburgh Steelers. “We both had a pretty good idea we were going to follow Rex wherever he went,” Leonhard said. Scott and Leonhard, who turned down more money from the Denver Broncos, anchored a Jets defense that finished No. 1 in the N.F.L. in yards allowed per game. Leonhard broke his thumb Nov. 15 against Jacksonville but did not miss a game. Leonhard is a tough player, but above all, he has been a calming influence during a turbulent season. The Jets lost nose tackle Kris Jenkins to a season-ending knee injury midway through the season, and the other safety, Kerry Rhodes, was benched for three games because he played poorly. Leonhard probably had his best game of the season against the Chargers, even though the play in which he was kicked twice did not result in a turnover. Much to Ryan’s displeasure, the pass to the Chargers’ Malcolm Floyd was ruled an incompletion, not a completion and a fumble. The Jets’ defense, with Leonhard calling the signals, threw so many different looks at Philip Rivers that they could tell he and the Chargers were getting confused. Leonhard’s interception was probably the turning point of the game. As they watched film of the San Diego game, the Jets said they got a bigger kick out of the play in which Leonhard was kicked in the head. Eric Smith, the third safety, already knew Leonhard was tough, but the play seemed to underscore that. He inspired them. “That’s the stuff of legends right now,” Rhodes said. Scott said that a lot of Ravens wanted to join Ryan in New York, but he and Leonhard had the chance because they were free agents. They did not come as a package deal, but they talked a lot, and neither was surprised that the other ended up with the Jets. Like the Jets this year, the Ravens advanced to the A.F.C. championship game last year with a rookie coach, John Harbaugh, and a rookie quarterback, Joe Flacco. But Scott thought Ryan, the defensive coordinator, should have been gotten the job instead of Harbaugh. “One thing that helped us get over that was that Rex got what he deserved,” Scott said. As everyone knows by now, the Jets play a ruthless, marauding style of defense that does not change much from game to game and is, as Scott said, the antithesis of a bend-don’t-break defense. The defense plays for Ryan and his assistant coaches. Leonhard says his thumb does not hurt any more. His head feels fine. Shaun Ellis, the defensive end, broke his left hand against San Diego and did not practice Wednesday, but Leonhard said Ellis and the Jets’ training staff would figure out a way to tape him up Sunday. The shiner, his thumb and the bump on the back of his head are signs that he has not taken any shortcuts to get here.